The art of Vera Atlantia reflects the intimate connection to source and the deepening experience of spiritual awakening. In her work she explores themes such as divinity, healing, higher realms, unity consciousness and realizing ones true essence. 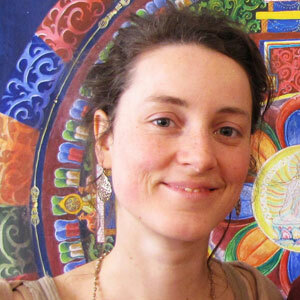 She experiences the practice of painting, writing, meditation and chanting as gateways leading to higher dimensions. During the process of creating she often enters deep states of ecstasy and transcendence, being infused with the light and bliss of the Creator. Having experienced the healing power of creating art when being confronted with death she was led to train as a painting therapist between 2010 and 2012. Soon after she initiated a regular painting workshop in Vienna, called ‘Seelenmaler’ (Soul Painting), which emphasized painting as a tool for self-inquiry, healing & discovery. Vera Atlantia participated twice in the Visions in the Mischtechnik Seminar in Italy, where she met the famous Austrian visionary artist Professor Ernst Fuchs and the artists who subsequently formed The Visionary Guild. These encounters led to deep and transformative friendships which further contributed to her artistic development. In 2013 she was invited to work as an art teacher at the Vienna Academy of Visionary Art where she is now an integral part of the Visionary Guild, a collective of several international teachers. In 2015, Vera Atlantia got trained as a meditation teacher by Ananda Vdovic (vocalist of ‘Sacred Chants of Devi’) and is now passing on the vedic knowledge of mantras and meditation with great love and joy. Vera is currently working on art commissions & collaborations, teaching sacred art workshops and meditation internationally. If you are interested in getting a unique artwork by Vera, please send your query here. For more information about Vedic Mantra Meditation, please click here.